Audience participation: What better show to see than the one you are in. 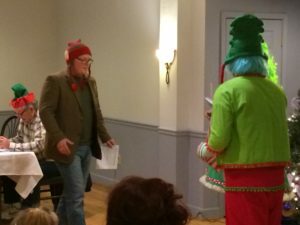 Our audience participation in our 25 years of bringing comedy murder mysteries has been a delight due to the wonderful characters we have given you to play. Here are some of the characters played by you, our Audience. There was The Big Kahuna from Dead Dude Ranch. I chose him because he had to throw some bones down on the floor and dance around them. Frosty Slabb from Doctor Marcus Will be DOA. Just because of that name. Twalette Waters from Cat On A Hot Tin StreetCar. Another funny name. Tiny Young Jim Bob from An Affair to Dismember. As a result of that name we always tried to recruit the biggest guy in the room to play this character. Ghost of Julia Childish from Holiday Recipe For Murder. Rocky Rambo from Death By Disco. We still do this show as a private show for groups. Our current show has some good characters for you to play. Big Bucks Buchwald is our victim who gets murdered. Lets see your death scene. Miranda Wrights calls for lots of dramatics. Come on drama queens this part was written with you in mind. Honey Lulu a parody of Honey BooBoo. Therefore a good character to steal the show with. Mrs Bunny Buchwald with champagne in hand. Just seems like a fun character to play. The Snooper, maybe you want an opportunity to display your wrapping skills. Most of all there is the killer is one of the audience characters. I’m not telling you who that is. You’ll have to join us and play detective on Saturday nights at the Mystery Café.